Phlebotomists draw blood from patients for tests, research, transfusions, and/or blood donations. They work primarily in hospitals, doctors’ offices, blood donation centers, and laboratories. Along with drawing blood, they also label the blood for processing, enter information in computer databases, and assemble and maintain all the medical instruments needed to draw blood. Phlebotomists often explain the procedure to patients and reassure patients who are nervous. Sometimes, they also have to care for patients who have an adverse reaction after their blood is drawn. Phlebotomists require a wide variety of skills. Some of these are hard skills such as knowing how to perform certain medical procedures. Others are soft skills, such as compassion for anxious patients. This is a sample resume written for a phlebotomist. You may simply read the sample below or download the Word template by clicking on the link. Delivering kind and attentive service to patients of all ages. Consummately professional phlebotomist with 6 years’ experience within physicians’ office and hospital settings. Apply keen attention to detail to ensure proper collection and labeling of all blood samples. Diligently ensured the proper sterilization of medical instruments and blood lab, closely following infection control guidelines, maintaining lab equipment, and safely disposing of blood products. Mentored new hires in effective phlebotomy techniques, patient relations strategies, procedure documentation, and HIPAA requirements. Frequently assigned to work with child patients upon request of supervisor, based on excellent ability to calm and communicate with them. Earned multiple “Employee of the Month” awards. MISSISSIPPI GULF COAST COMMUNITY COLLEGE, San Jose, Calif.
You can use these skills lists throughout your job search process. Firstly, you can use these skill words in your resume. In the description of your work history, you might want to use some of these keywords. Secondly, you can use these in your cover letter. In the body of your letter, you can mention one or two of these skills, and give a specific example of a time when you demonstrated those skills at work. Finally, you can use these skill words in an interview. Make sure you have at least one example of a time you demonstrated each of the top five skills listed here. Of course, each job will require different skills and experiences, so make sure you read the job description carefully and focus on the skills listed by the employer. Here are the top phlebotomy job skills to list. Phlebotomists usually have a constant flow of patients throughout the day. They need to be precise when drawing blood and labeling and keeping track of samples. Phlebotomists need to be able to clearly explain procedures to patients, and listen to their questions and concerns. Many patients will be nervous, so clearly explaining what is going to happen will put patients at ease. Verbal communication skills are therefore critical. 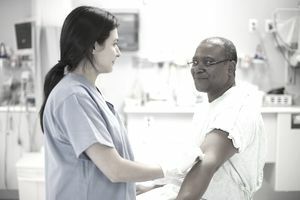 Most hospitals and doctors’ offices require phlebotomists to enter patient and specimen information in a medical record database on the computer. Having data entry skills and experience is a big plus for a phlebotomist. Physical dexterity (or motor skills) is critical for a phlebotomist. Phlebotomists have to work with their hands to handle equipment and draw blood. They need to be able to draw blood quickly and efficiently, with minimal discomfort for patients. Phlebotomists need to have strong interpersonal skills. In particular, they need to be able to empathize with and show concern and care for patients who are nervous. Empathy will help a phlebotomist interact successfully with patients and their families. Read below for a longer list of phlebotomist skills that includes the skills listed above. These skills are divided into distinct categories.